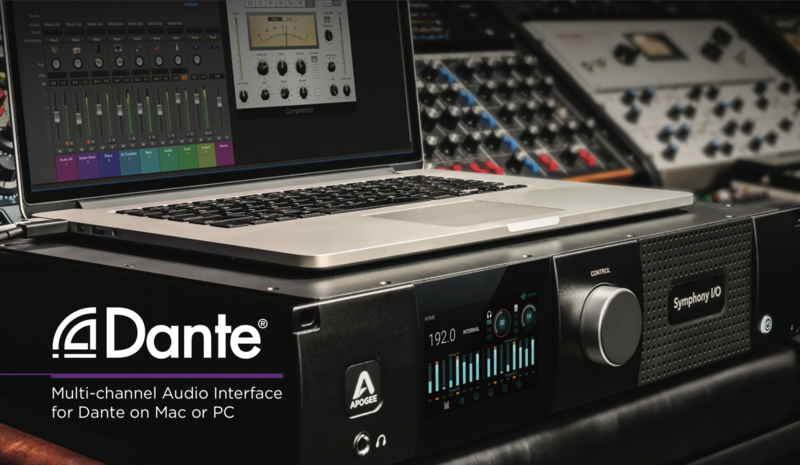 Announcing the Dante™ network option card for Apogee’s flagship audio interface Symphony I/O MK II. The Symphony I/O MK II Dante™ option card uses Audinate’s Dante™ Brooklyn II module which features plug and play media networking for up to 32 bidirectional channels at 96kHz and 16 bidirectional channels up to 192k. With the included Pro Tools HD peripheral port, route audio between your Pro Tools session, the Dante network and Symphony I/O modules. Customers can now use the amazing sound quality of Apogee’s Symphony MKII combined with the most powerful networking solution from Audinate featured in many large scale installations in Broadcast, Live, and Post Production venues. The Symphony MK II system can be configured with a number of custom options ranging from 8-32 analog I/O channels. Symphony MK II with Dante™ allows up to 32 channels with ProTools and redundant Dante connectivity to be fitted into a single two space rack device providing the smallest footprint available with this feature set. Symphony I/O MK II was been nominated for a 2017 TEC Award and is praised by customers and press internationally as the leading professional audio interface to set new sound quality standards for multi-channel recording.